Pan-fried scallop skewers served on a bed of wok fried mange tout. Clean the scallops and pat them dry. Place three scallops on each skewer. Wash the spring onions and finely slice. Cut the mange tout into strips. Heat a wok and add a drizzle of olive oil and then sweat the spring onions with a pinch of salt. Once soft, add the mange tout and cook for 1 minute an then add two cups of water and cook until all the liquid has evaporated. Heat a frying pan and add a drizzle of olive oil. 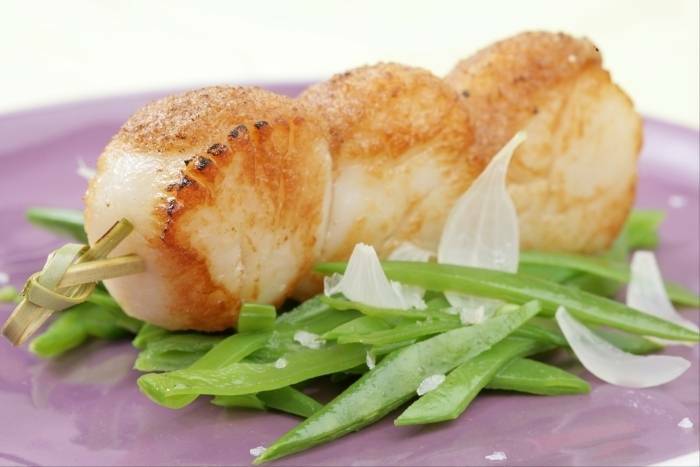 Add the scallops to the pan and cook for 1 minute on each side. Season with fleur de sel and piment d'Espelette. Serve the scallops skewers on a bed of mange tout.